We will be holding our 9th Annual AiM Data Acquisition Seminar on Saturday, March 16th, 2019 - Learn how to turn your AiM data into faster lap times. Past seminars have gotten rave reviews, and this year promises to be no exception. Roger Caddell, the national trainer for AiM Sports, will bring his many years of experience to give you a better understanding of data acquisition. The $35 cost includes a USB drive with all course materials and a catered lunch. 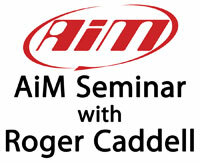 Discounts on AiM products will be offered on the day of the seminar. Seating is limited, and openings are filling up quickly. Free Shipping* on the AiM SmartyCam HD - This rugged mini video camera was designed specifically for racing. 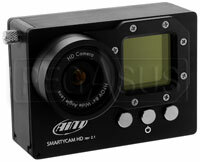 The SmartyCam HD has been tuned to provide DVD-quality on-board video without waviness or other image distortions. Connect to your AiM data logger to record speed, RPM, and more right on the screen. The standard 67 degree lens is perfect for use in closed cars. 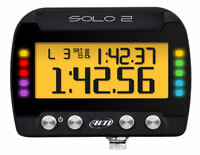 Free Shipping* on AiM Solo2 and Solo2DL On-Board Lap Timers - The Solo2 uses GPS and GLONASS positioning satellites to start and stop lap times. Using the included software, you can also see track mapping, acceleration and braking! Free Shipping* on the AiM EVO5 Data Logger - This is the latest generation of the powerful EVO series of data loggers. Eight analog channels and 4 wheel speed channels; sensor harnesses connect via two motorsport-spec Deutsch connectors. The 4GB memory is expandable by adding a common SD card. Includes GPS08 module and the new Race Studio 3 software. Does not include a display. Cartek Sequential Shift Light - Seven bright LEDs notify you as your shift point approaches. Programming is easy. Simply bring the RPMs to the first alert level, then back off the throttle. Then bring the RPMs to the top alert level and back off. The unit stores those two values and calculates the steps in between. Self-Locking Nut Plates - These lightweight Nut Plates are a great way to add female threads in an inaccessible location. The all-metal locknut is rated to 450 F. We offer 4 different styles of Mil-Spec nut plates with SAE fine (UNF) threads. Metric Floating Nut Plates - These self-locking, all-metal nut plates are similar to MS21059 Mil Spec floating nut plates, but with metric thread sizes (M3 through M8). They install using the same rivet sizes as MS21059 nut plates (2.5mm / 3/32 inch on sizes M3 through M5 and 3.3mm / 1/8 inch on M6 and M8). Engine Bearings for Ford 1.6L - Was the oil pressure in your FF1600 getting a little low towards the end of last season? Pegasus is your source for hard-to-find bearings for FF1600 engines. We have a great selection of rods, mains and thrust washers for standard or undersized cranks in stock. We even have main bearings for line-bored blocks. We also stock cam bearings and connecting rod small end bushings. Free Shipping* on the FF1600 5-Port Dry Sump Pump - If your oil pressure was really low, a new oil pump might be in order. 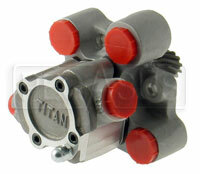 This side-mounted pump by Titan is virtually standard on FF1600. 1 inch wide scavenge and 5/8 inch wide pressure rotors help with piston ring sealing for more power. 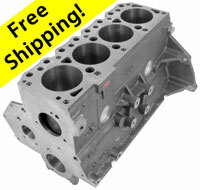 Free Shipping* on Ford 1.6L Kent Engine Blocks - If things really went sideways in your engine bay... These blocks are newly manufactured by Ford using original blueprints and modern techniques. Some areas have been strengthened for increased durability. Short-deck Lotus Blocks ($1749) are also in stock! Creafoam Bead Seat Kits - Includes everything needed to make a custom seat insert: vacuum bag, Creafoam beads, resin, hardener, mixing pail, mixing stick, gaffer's tape and instructions. Available in 5 sizes from 5 to 30 gallons total volume. Beta Tools C30S Super MaxiTank Rolling Work Station - This heavy-duty workbench features a worktop with a drain and a 2-ton load capacity. Hydraulic jack at one end lowers two swivel casters and lifts the feet for surprisingly easy mobility. Five locking drawers and a locking "garage door" keep your tools or your project secure. Ships via Truck Freight (not eligible for free shipping). Congratulations to everyone who participated at the 2018 Runoffs®! If you received a Pegasus Contingency Award, be sure to use it before it expires at the end of this month.